Kleefeld on Comics: On Strips: News? There are a number of sites out there that present pretty much nothing but comic book news. It's not a huge market and doesn't pay particularly well, but it's there. There are other sites dedicate to manga and anime news. Again, not tons of competition, but still viable concerns. Most of the more general news sites that talk about pop culture in any capacity bring up comic book news fairly regularly too. Heck, Stan Lee was on NPR's Morning Edition just yesterday. But what we don't see much of is comic strip news. There aren't any dedicated news sites for strips, and it's rare they crossover into comic book news sites. Peanuts is getting a bit of attention at the moment, but mostly in reference to the movie. Aside from that, we get about zip. There's a Garfield animated cartoon that's been around since 2009 but it's barely even mentioned on Garfield.com! And aside from the occasional (and unfortunate) death of a creator and an annual passing mention of the Reuben Awards, we don't hear much. So I'm sitting here wondering why that is. Why isn't there enough news to warrant at least a few dedicated comic strip sites? Why does a magazine like Hogan's Alley focus primarily on historical pieces? (I mean, besides the fact that it's a printed magazine and inherently slower than a website.) Why do comic books dominate headlines over comic strips? Dean Young inherited Blondie when his father passed away in 1973. He's been working on the strip ever since. Pearls Before Swine and Six Chix are two of the more recent comics United and King have syndicated. They both debuted fifteen years ago. Bill Amend and Gary Trudeau dropped their daily strips in favor of Sundays only in 2006 and 2013 respectively. Many newspapers continue to run Foxtrot and Doonesbury re-runs during the week. Charles Schultz died in 2000, a day before the last new Peanuts ran. Aaron McGruder quit Boondocks in 2006. Both strips continue to be syndicated in re-runs. Little Orphan Annie ended in in 2010 after an 86-year run. 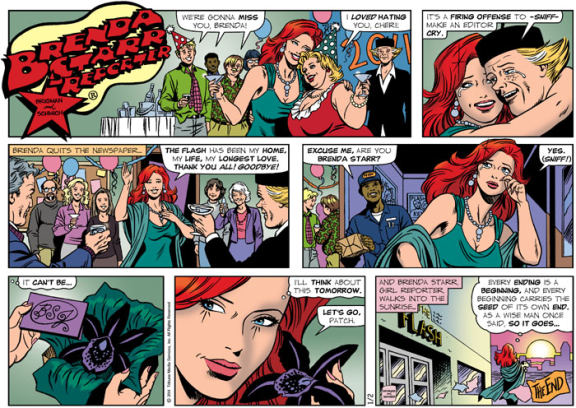 Brenda Starr ended in 2011 after 70 years. Where I'm going with this is that the comic strip market is so closed and insular that it doesn't really make news. We don't have new strips debuting, we don't have many old strips retiring, the original creators have largely passed away already so their work is being continued by a younger generation... There's just not much going on. Argueably the biggest news in comic strips last year was Bill Watterson doing several guest strips for Pearls Before Swine. Watterson, who had retired as a cartoonist nearly two decades earlier! It was news because he was no longer in the comics industry. He left in 1995. He was news in large part because he was the first outsider to appear on the funny pages in over a decade. Readers bemoan the nature of legacy comic strips. That they recycle the same jokes and gags their predecessors use, and keeping them in circulation prevents new voices from being heard. But the often unspoken corollary to that is that recycling jokes and keeping out new talent means nothing new is happening. With nothing new happening, there is no news. With no news, there are no news sites. With no news sites, there's no easy way for readers to stay informed -- and interested -- in the comic strips beyond the strips themselves (which, as noted before, are mostly recycled). With decreasing interest, there's less incentive to bring in new cartoonists. With no new cartoonists... well, we're back at the beginning of this cycle. The insular nature of comic strips is, in effect, creating a downward spiral of disinterest among readers. There are certainly other factors at play here, as well (declining in newspapers generally, for example) but the comic strip industry isn't doing itself any favors by making their "big" news events things like this extra Sunday supplement of old strips that's supposed to be in papers this weekend. Unfortunately, the audiences drawn to the main comic book news sites don't show a sizeable interest in newspaper strips, or even webcomics without the pedigree of comic books attached unfortunately. Sites will cover things outside of American comic books when there's interest (see: Star Wars), but otherwise it's unfortunately a losing gamble. I don't know of any that exclude books, but there are some that focus on strips and editorial cartoons. I was going to suggest The Daily Cartoonist and Comic Riffs too, but Mike beat me to it. I check both daily for my Comics A.M. column, and I also try to mix in whatever comic strip news I find—often local-paper interviews of the creators. I'm not sure there is enough news out of the industry to keep a daily blog going. But just because we aren't blogging doesn't mean people aren't paying attention. Whenever a newspaper changes or even talks about changing their comics page lineup, they get a huge reaction from readers. Those articles pop up in my Google News feeds all the time. I quit reading comic strips when I stopped subscribing to my local paper, the Boston Globe, on paper. The comics interface for the digital edition is horrible—basically, you pick a comic from the menu, go read it, then go back to the menu for the next one. And the comics are super small. The full-size comics page is actually a great way to read comics, now that I think of it. Both GoComics.com (United/Universal) and ComicsKingdom.com (King) offer ad-free make-your-own-page features for about $20 a year. Good reproduction, quick loading, reasonable price. The "Kit 'N' Carlyle" panel by Larry Wright ended on November 7, 2015. "Apartment 3-G" will run its last strip on November 21 or 22 (reports differ). Julie Larson's panel "The Dinette Set" will end on November 29, 2015.
are among the few papers that carried it on November 15. Tom Richmond, Brian Crane, and Mac & Bill King as guest cartoonists this week. Barney Google returns to the Snuffy Smith comic strip this week (Nov. 16 - ?). prose novels by J.J.Salem beginning next spring. The Phantom and the Mary Worth (!) comic strips. fairly good job of reporting their news on Fridays.